ENTER INTO THE #KEEPPLACESWILD PHOTOGRAPHY COMPETITION TO WIN A $2,000 OXLEY TRAVEL VOUCHEr TOWARDS A TRIP TO LORD HOWE ISLAND OR NORFOLK! (a) Register to see The Map to Paradise at an event organised by us, the filmmakers, in Australia (from 16 March 2019) - www.themaptoparadise.com/tickets. (b) Take a photograph of a wild place you love on your phone or with a camera. (c) Hashtag #RestoreParadise & #KeepPlacesWild on Instagram or Facebook + tag @themaptoparadise. (d) Write a brief description about why this place ‘should be protected’ or ‘stay protected forever’. (e) Expert nature photographers Rosie Leaney and Scott Portelli will judge the entries. They will select the winner! 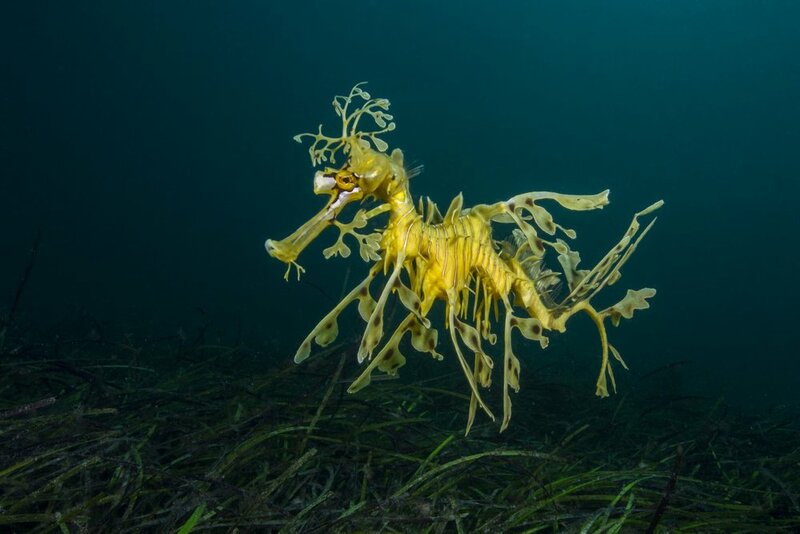 This is a Leafy Seadragon, a relative of the Seahorse, found in southern regions of Australia and nowhere else in the world. This creature is so incredibly beautiful and unique, yet so fragile - just like the marine ecosystem that supports it. The coastal waters in temperate Australia, also known as the Great Southern Reef, support so many wonders like this and need more protection from over-fishing, pollution, climate change, and big oil developments. Rosie grew up in the UK, and has been living, diving and photographing in Sydney for 10 years now. You can find her at Dive Centre Manly where she works as a dive guide and underwater photography instructor. Rosie loves photographing to highlight conservation issues, and recently won the UN World Oceans Day Photography Contest with an image of local divers cleaning up plastic pollution in Manly. She also enjoys writing and show-casing the local Sydney marine life for various dive publications. Tonga, a former whaling nation, now attracts people form all over the world to view humpback whales alive in all their glory - it is one of the only countries in the world that you can legally enter the water with these gentle giants. Swimmers can witness behaviour like this 'heat-run', where several whales are competing to mate. Tonga, with the visiting whales and many photographers, provides a unique opportunity to collect valuable data which can be used to better protect the whales in the future. This spurred me to launch the Tongan Fluke Collective - a central database where people can donate their tail fluke shots of humpbacks. These shots are free to access by scientists and allows them to collect data on things like population, migration & movements, relationships, age and site fidelity. Scott Portelli is an international award winning wildlife, nature and underwater photographer. A member of the Australian Institute of Professional Photography (AIPP), he is regarded as a leading professional in his field. Scott has spent thousands of hours in remote locations across the globe filming and photographing wildlife, the underwater environment and wild places. He was awarded at the prestigious Wildlife Photographer of the year in London in 2016 and announced National winner of the Sony World Photography awards 2016 and winner at Travel Photographer of the Year 2015. His conservation documentary also took out 2 awards at the prestigious French Underwater Film Festival in Marseille in 2015. More recently he was awarded winner in the Animal Behaviour Category at the Australian Geographic Nature Photographer of the Year ANZANG 2017, Winner in the Underwater Category of the Asferico International Nature Photography awards 2018, and runner up in The Underwater Photographer Of The Year 2019. The prize is a $2,000 Oxley Travel voucher to redeem towards a holiday to either Lord Howe Island or Norfolk Island utilising their services. Expires 30 December 2020. Entry is open to every person who has purchased a ticket to see a screening of The Map to Paradise, which has been organised directly by the filmmakers in Australia and which is listed on our website - www.themaptoparadise.com/tickets. If another person purchased your ticket under their name and we select you as the winner, you will need to show the original receipt of entry into a film screening. If you purchased your ticket at the door of the theatre and you have not shared your contact details with us at the event and you are the winner, you will need to share some proof of purchase. Employees, immediate family members of employees, employees of any company associated with the prize are ineligible to enter. Entrants aspire, in good faith, to enter works which they believe best interpret and positively advance The Map to Paradise’s key educational message to #RestoreParadise & #KeepPlacesWild. The competition commences on 16th March 2019 and entries close on 30th September 2019 (competition period). To enter, Eligible Entrants must (a) take a photograph of a wild place they love on their phone or camera (b) hashtag #RestoreParadise & #KeepPlacesWild on Instagram or Facebook + tag @themaptoparadise, and (c) write a 1-2 line description about why this place ‘should be protected’ or ‘stay protected forever’. Our panel of expert judges, including Photographer Scott Portelli and Rosie Leaney will select the winner based on skill, technique and merit. They will evaluate the content itself, as well as the the words and meaning attached in relation to The Map to Paradise’s campaign message to #RestoreParadise & #KeepPlacesWild. For example, you may photograph a national park (or protected area) on the land or in the sea, such as the Great Barrier Reef Marine Park, or perhaps an animal you might find there. Alternatively, you might choose to photograph an underwater landscape that perhaps has no protection at all. We suggest you take a look at the zoning maps online by national parks or sometimes fisheries to find what is and what is not protected, before you write your statement. Humans may also be included in your photographs. When we announce the winner, we will include a statement from the judges as to why they selected the winner. The winner will be notified by the end of November 2019. Winners will be notified by phone/email. The winners will have their details published in www.themaptoparadise.com and the winner will grant The Map to Paradise permission to repost their photograph on the website and on social media without a fee attached. If the winner does not respond to claim their prize within two weeks, the judges reserve the right to re-allocate the prize to a runner up. Copyright of the photograph remains with the person who took the photograph. The prize cannot be swapped for a cash alternative. The organisers of the prize (The Map to Paradise film crew) reserve the right to add additional prize categories and modify the conditions or judging process, if necessary.